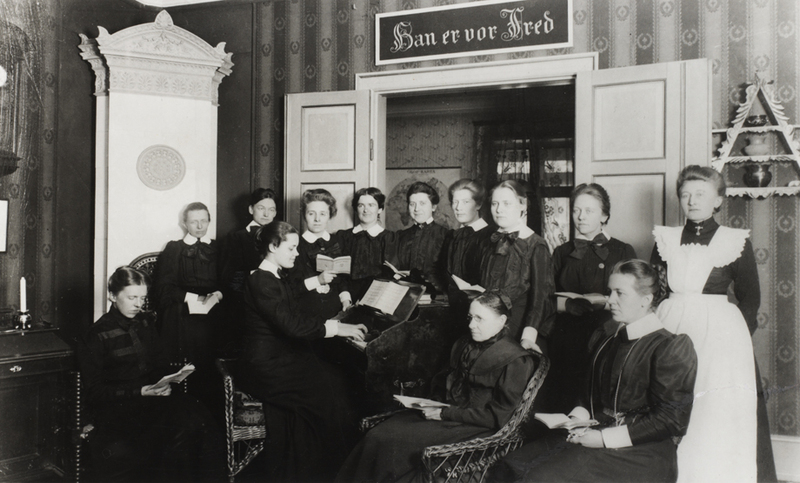 In 1900, the Danish Evangelical organization, Women Missionary Workers (Kvindelige Missions Arbejdere, henceforth KMA), was founded in Copenhagen under the motto “Women Working for Women”. The organization was mainly inspired by the founding of the Swedish KMA (1894), by modern Danish revivalist movements such as Inner Mission (Indre Mission) and by the so-called Protestant International – a millenialist movement that aspired to bring the Gospel and enlightenment to the world. They were also very much affected by the news of the 1890’s Abdülhamid II massacres in the Ottoman Empire, which had a profound impact on significant sections of the Danish public – in fact, the massacres served as the main impetus that transformed the Danish KMA from a Bible study group to an effective missionary NGO with worldwide ambitions within a few years. Thus, while the Danish KMA would also send missionaries to India, North Africa, the Danish West Indies (from 1917: the Virgin Islands) and China for example, Armenia was the first mission field, and Armenians would remain the most important focus of the organization until it was dissolved in 1981. In the beginning, the Danish KMA mainly concentrated on raising awareness of the plight of the Ottoman Armenians in the wake of the massacres, while also sponsoring orphaned Armenian children in American and German care, in places like Bitlis, Van, Mush, Kharpert (Harput) and Constantinople (Istanbul). 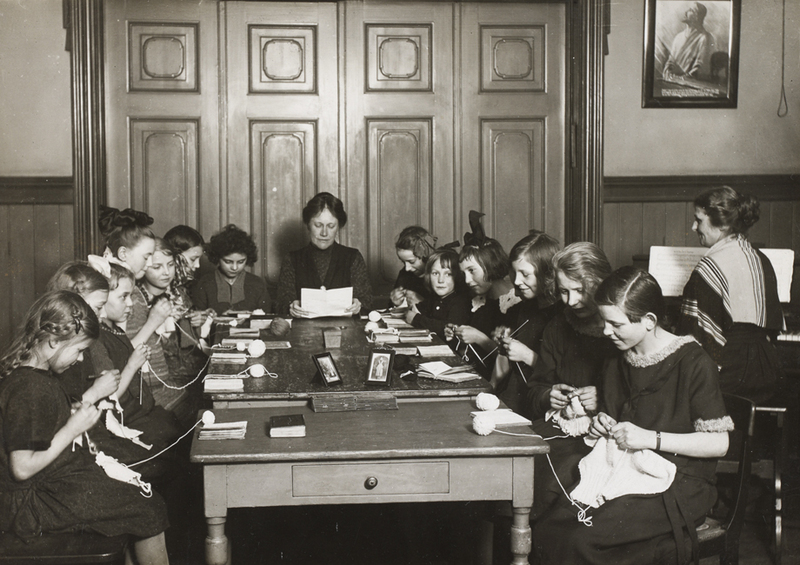 Soon, however, the women of the organization decided that they wanted missionaries and an orphanage of their own. 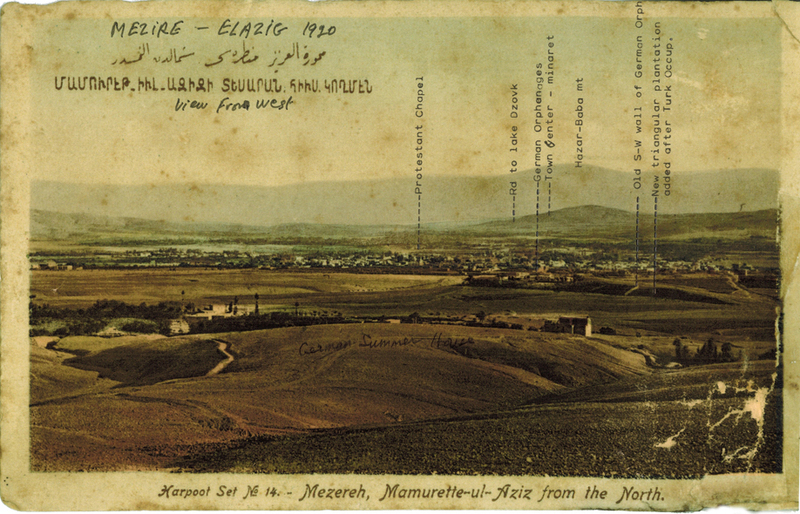 In November 1902, the KMA therefore established the orphanage Emaus in Mezreh/Mezire/Mamouret-ul-Aziz (present-day Elazig), in the Kharpert/Mamouret-ul-Aziz province, where they already had good connections with German and American colleagues, and where safety and infrastructure were deemed to be relatively sufficient. 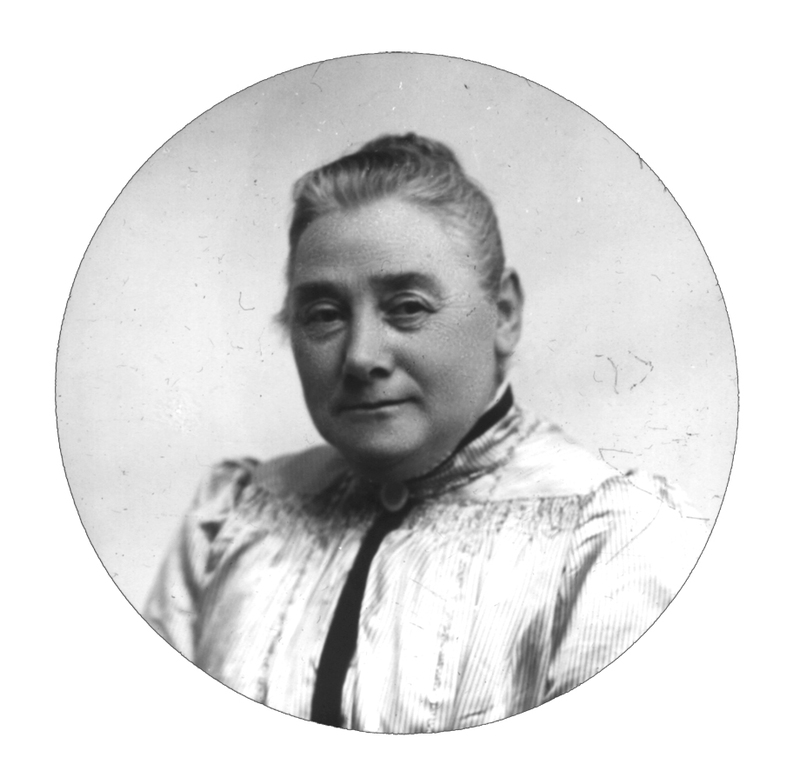 Emaus was mainly a Danish-run institution, but, initially at least, it was sometimes referred to as “the Scandinavian orphanage,” since it received financial support from Swedish, Norwegian and Finnish KMA’s, and one of the early key staff members was the Swedish missionary Alma Johansson. 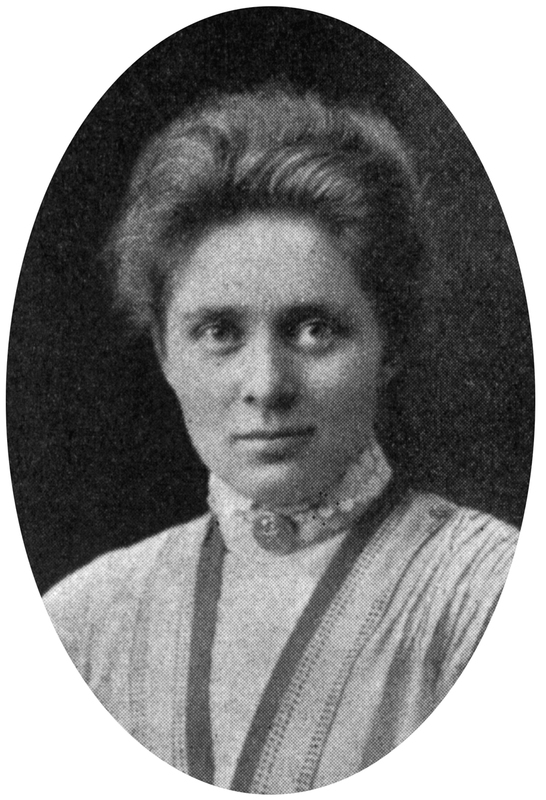 The first Danish KMA missionary in the Kharpert province was Christa Hammer, who was a trained head nurse. She arrived in the late summer of 1901, at first to assist the German missionary organization Deutsche Hülfsbund (DH) and to learn the necessary languages. But her main task became establishing Emaus with Alma Johansson and the Danish missionary Christiane Black. They initially started the orphanage with 15 orphaned Armenian children. This was a troublesome task at times. In November 1902, for instance, few days after the official opening of Emaus, Christa Hammer received death threats from local Turks. At the same time, the vali (governor general) of the province, who at first had been rather cooperative, all of a sudden proclaimed that he wanted to remove the Armenian children from the home, as they were considered Ottoman property. After some intense lobbying and with a little help from local German missionaries and diplomats, this first major crisis was averted, but soon things were about to get worse. Hammer died of typhoid fever in Mezreh after two years and lies buried somewhere in or around modern-day Elazig, while Johansson and Black both got seriously ill and had to return home, but the Danish KMA and the organization’s Armenia Committee were not discouraged. They kept sending new field workers to the province and beyond, all of whom were graduates from the KMA mission school in Copenhagen, established in 1902. 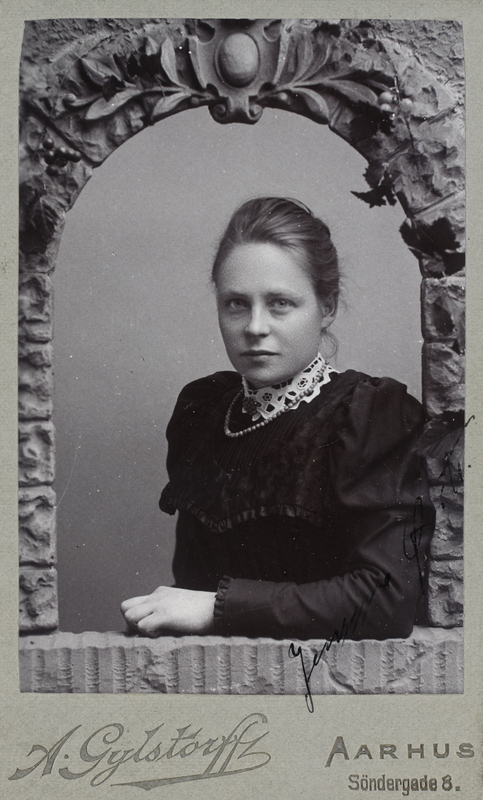 Among the Danish KMA missionaries to follow were Wilhelmine Grünhagen and her daughter Sigrid. They went to work at Emaus, until Sigrid got married to a German colleague named Storck in 1910 and settled in Marash, while Wilhelmine returned to Denmark around the same time. When Wilhelmine was almost 60 years old, she returned to the Ottoman Empire to continue working among surviving Armenians after the genocide and the armistice, first at an orphanage in Scutari (Üsküdar), close to Constantinople, and later in Greece. In the Mamouret-ul-Aziz province, there were also Danish KMA field workers before the genocide, including Hansine Marcher, who became leader of the DH girl school in Mezreh; Jenny Jensen, who became leader of the DH orphanage Elim right next to Emaus after arriving in the Kharpert province in 1905 with the Norwegian KMA missionary Bodil Biørn; Maria Jacobsen, who mainly worked as a head nurse for American Board (ABCFM) in Mezreh and Kharpert from 1907; Karen Marie Petersen, who arrived in 1909 and ended up replacing Wilhelmine Grünhagen as the leader of Emaus; and Jensine Ørtz (Jensine Oerts Peters), who worked with the German missionary organization Christoffel Blindenmission in Malatya after a brief stint in Mezreh. Several of these Danish missionaries – Maria Jacobsen, Karen Marie Petersen, Hansine Marcher, and Jenny Jensen – witnessed the 1915 Armenian genocide, recorded important testimonies about the atrocities and saved literally thousands of lives – especially Petersen at Emaus and Jacobsen at the American Board facilities. 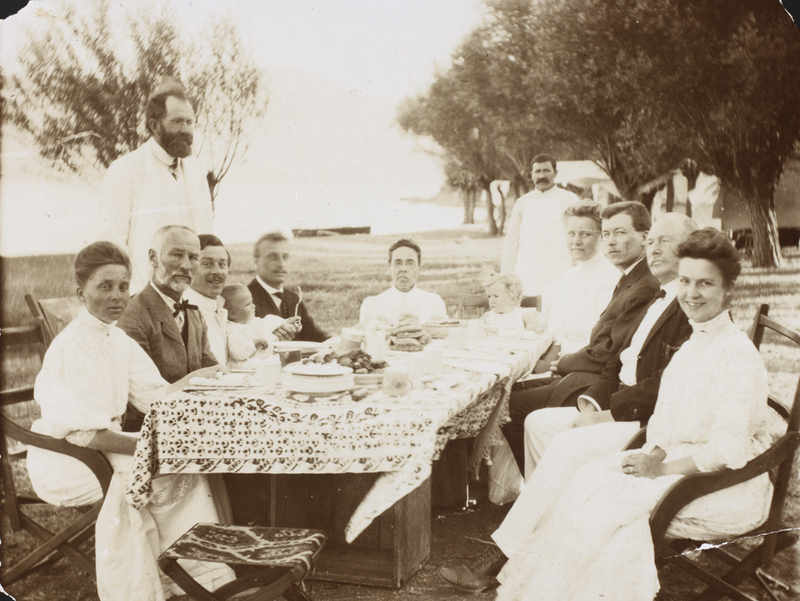 Most of these missionaries continued working for the KMA, or for other organizations like the Danish Friends of Armenians (Danske Armeniervenner, DA – the Danish relief worker and teacher Karen Jeppe’s organization) and the Industrial Mission (Industrimissionen, IM); they continued working among genocide survivors in Syria, Lebanon, and Greece. At the KMA mission school at Mynstersvej 3, Frederiksberg, Copenhagen. C. 1903/4. Just about all the Scandinavian missionaries in the Ottoman Empire from 1902 to 1914 received training here. The mission school cooperated with hospitals, schools, etc. in Copenhagen and elsewhere, so that the students could receive additional training as nurses and teachers. Some, like Maria Jacobsen, also received specialized training abroad before being sent into the mission field. Harput, Anny Tracy Riggs Hospital. ABCFM stuff from the KMA archives, nothing written on the back except "Souvenir Postcard"
Building the Annie Tracy Riggs Memorial Hospital, 1909. The dot or black marking on the left of the building is where Maria Jacobsen had her office or quarters. 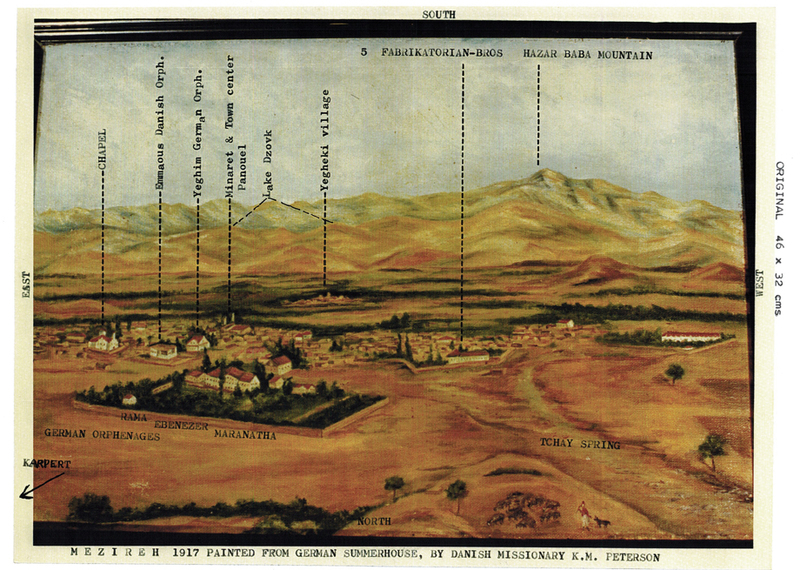 In 1917, Karen Marie Petersen, Danish KMA-missionary, teacher, and director of the Danish orphanage Emaus, painted this panoramic view of Mezreh, the Golden Plains of Kharpert, Lake Dzovk (Hazar Gölü/Gölcük, a major massacre site in 1915) in the background, etc. This was a time when she was basically under siege at Emaus, where she sheltered 121 survivors, some of them illegally. At the time she also worked with several local Kurds to smuggle Armenians to relative safety in Dersim and sometimes beyond. In her diaries Petersen writes about the massive stress from the beginning of the genocide in 1915 to early 1919, when she and Maria Jacobsen were finally relieved by American colleagues and friends. 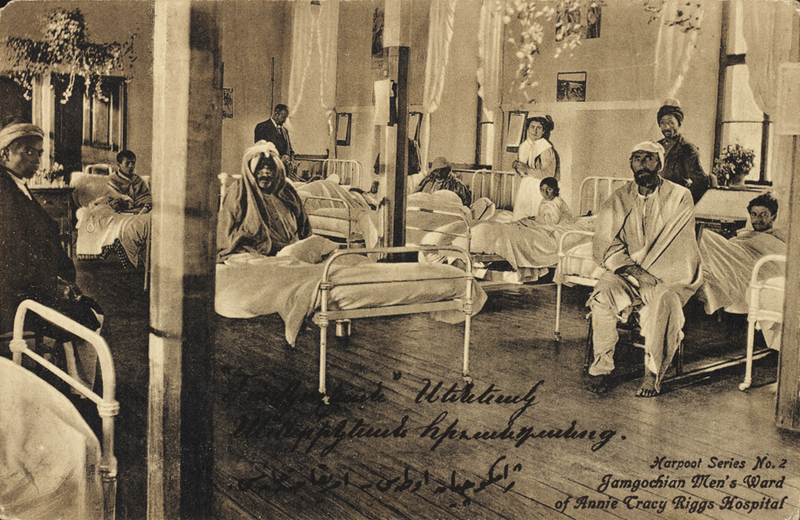 The stress and fear at Emaus was about as bad as it could be here in 1917, when the Americans left the Ottoman Empire, leaving Petersen and Jacobsen pretty much alone with the heavy responsibility of caring for Armenian survivors in Mezreh and Kharpert. 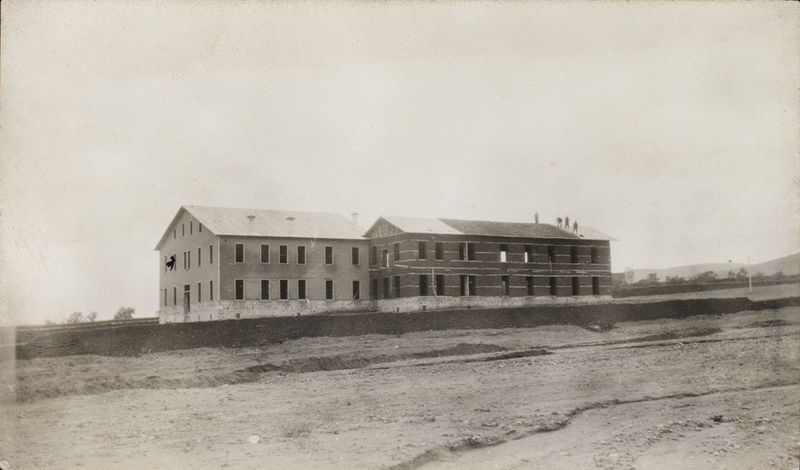 There were many other severe causes for stress at Emaus and beyond: the neighboring German Elim orphanage, led by Danish KMA's Jenny Jensen, had been emptied and the c. 200 children had been murdered; there was death and mourning everywhere - Petersen was one of the Westerners who tried in vain to get permission to leave on the death marches with her people in 1915, she desribes that very vividly in her diaries, including how she lost the will to live for a while; every time Petersen went to the market to buy supplies, she received threats that Emaus would be next; she had little care packages with food and blankets ready for the Armenian women and children at the orphanage if (or, as she often had reason to believe: when) deportation orders arrived or if the gendarmes would simply empty the place without warning; etc. One can speculate that painting this picture in 1917 during an ongoing genocide was therapeutic for Karen Marie Petersen at Emaus, a way of keeping sane, as well as a tribute to the beautiful landscape that she loved and, perhaps most of all, to all that now was dead or dying: The mighty work of the missionaries, indeed, but more importantly the Armenians, including the famous Fabricatorian brothers and their houses marked on the painting, and with them most traces of an Armenian presence on ancient Armenian lands. 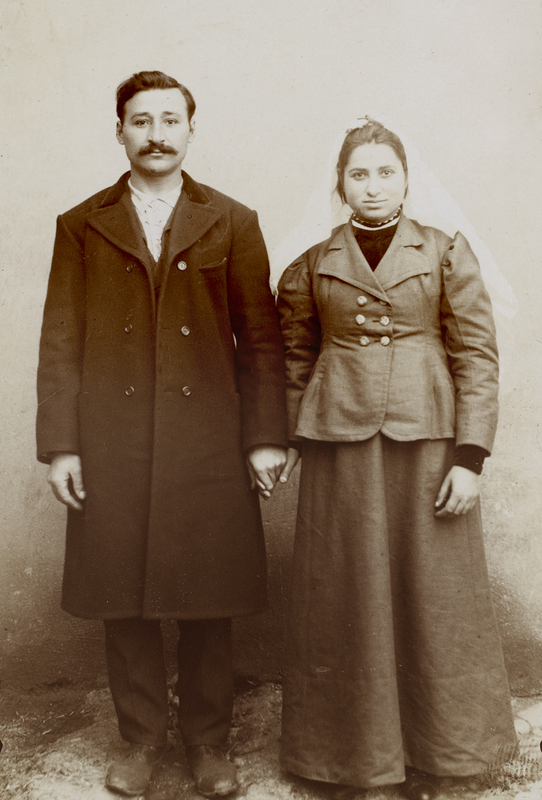 Kharpert/Harput (Danish National Archives, Archives of KMA, Women Missionary Workers). Maria Jacobsen wrote on the back that it's the entrance to the town, and that the woman on the right is a Turkish beggar who always sat there. The boys and girls at Emaus։ Caption on the back: Here you see the whole crew who performed the show. King Herod thrones in the middle surrounded by his ministers. The high priest wears the white robe. The others are the wise men, the scribes and the servants. Taken on 18 January 1912. Can you tell that they're [dressed as] real Oriental types? The play was probably staged for the benefit of not only the orphans and the missionaries, but for the local Christian and Muslim dignitaries too, thus the Old Testament theme would have given it a broader appeal. 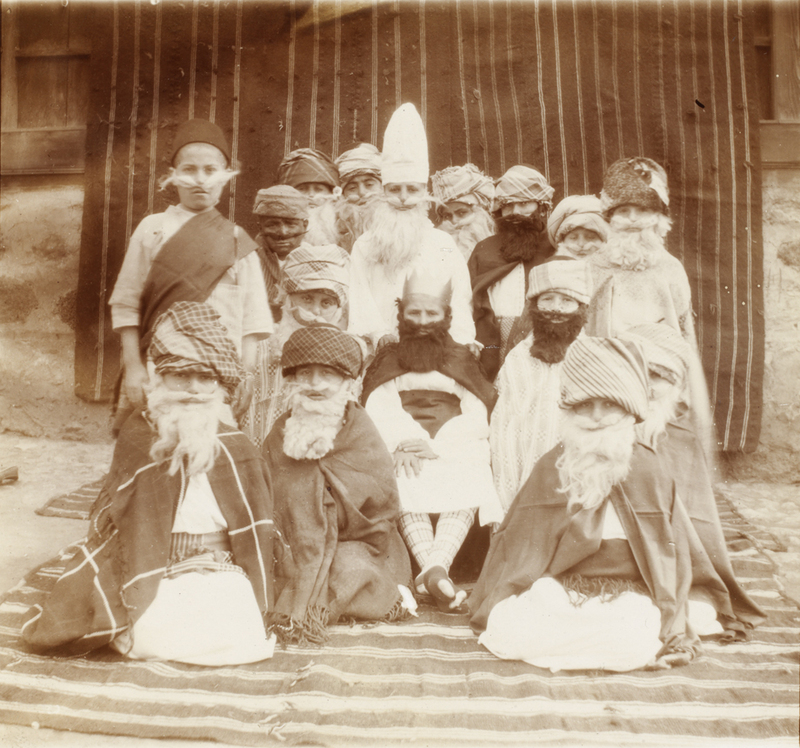 Interesting factoid: when Armenian orphans at the KMA Bird's Nest orphanage in Zouk Mikayil (the one they had before the final one in Djbeil) staged a play to welcome a visiting Danish politician in 1926, it was also from the Old Testament - Josef and His Brothers. Back home in Denmark the missionaries would most often prefer New Testament related themes, so I believe choosing the Old Testament may have been a way of accommodating Apostolic (and perhaps also at times local Muslim) sensitivities or preferences, like they did with traditional Armenian singing and dancing at Emaus and Bird's Nest, but there is too little empirical documentation to draw any firm conclusions regarding the theatre themes. 1) Orphan girl at Emaus, name and date unknown. 2) Unnamed Armenian orphan girl at Emaus, no date. 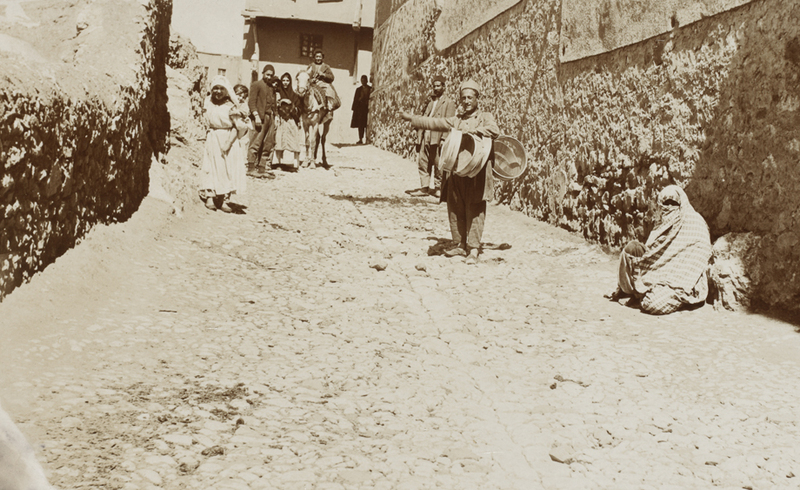 The little girl with the apple is survivor of the Adana massacres (1909). The Danish KMA didn't go to Adana to pick up orphans after the 1909 massacres, but they took in a number of refugee children arriving in or around Mezreh. 3) Makrouhi Gostanian, 7-8 years old, admitted in 1909, her father and a brother were murdered in Adana according to the caption on the back. Photo taken while entring the Emaus orphanage։ Sponsored by Norwegian KMA. C. 1910. 4) Mariam Vartanian, 6-7 years old, Emaus orphan girl, sponsored by Danish KMA's Daggry (i.e. Dawn) group for children in Odense. 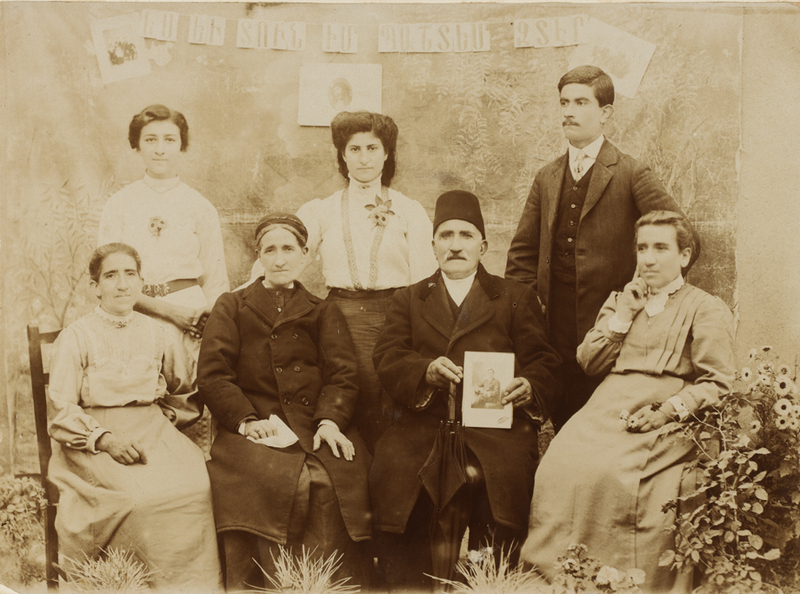 KMA had 77 of such groups around Denmark, studying the bible, singing hymns, making embroideries, etc., to sell in order to sponsor Armenians, and also arranging bazars selling embroideries, etc., from Emaus. Very crafty kids in those groups, they raised a lot of money and sponsored a lot of Armenians over the years. The photo is from 1909/10. 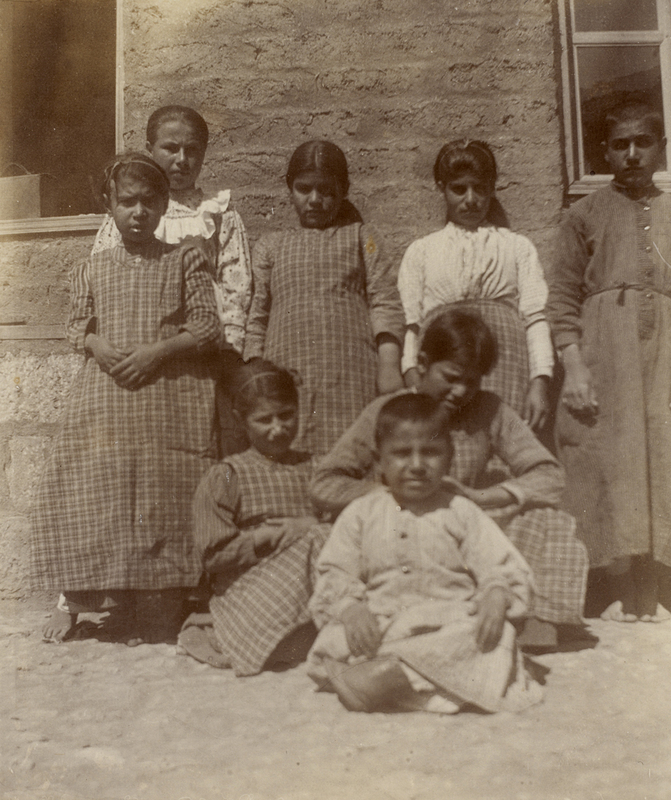 KMA archives, 8 orphaned Armenian children brought by Maria Jacobsen from Arapgir to Emaus at Mezreh, c. 1910. 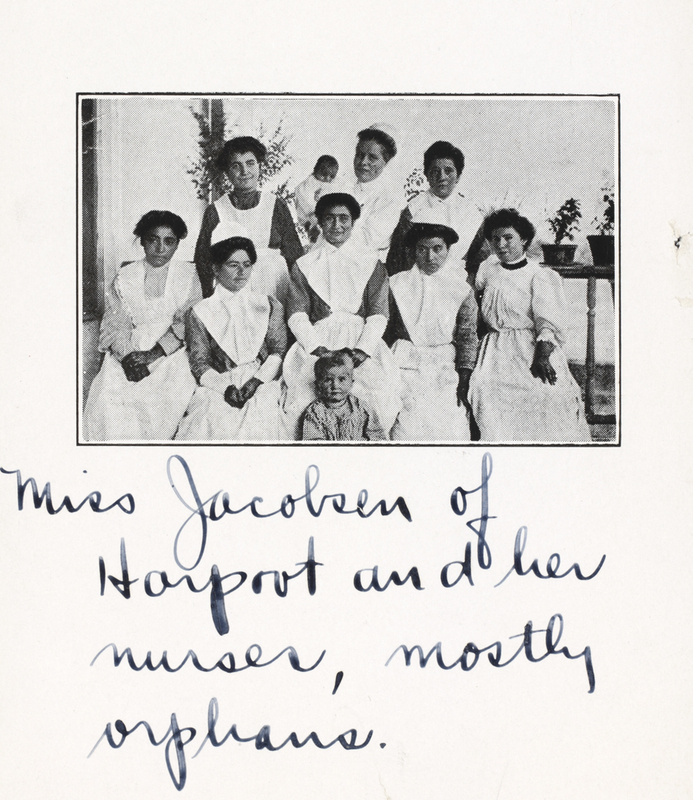 Three of the children are blind (trachoma probably), while the rest are, as it is put in the caption, crippled. Only one is named: Vartuhi, who has lost (or is born without) fingers and toes, so probably one of the girls in the back row to the left. It is safe to assume that the blind kids would be sent from Emaus to Christoffel and Ørtz at the Blindenmission in Malatya, where they had the expertise and the facilities. 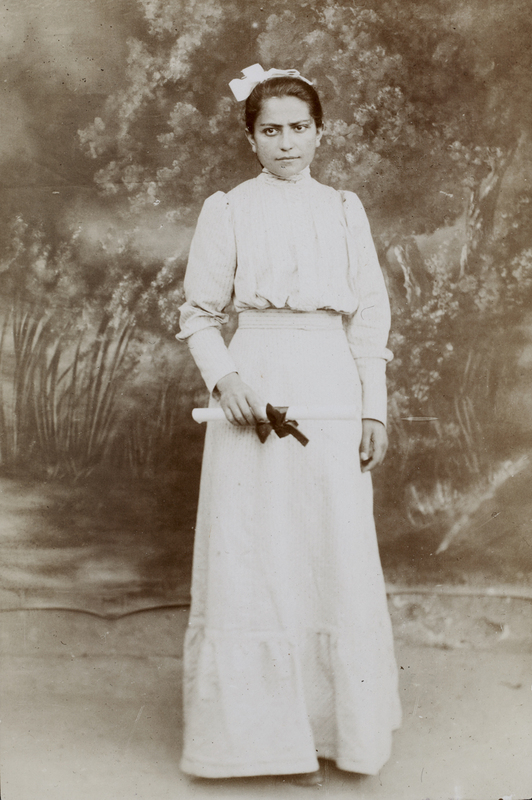 Mariam, age 17, the first to graduate from Emaus, c. 1910 - she got a sort of high school degree/teacher training degree. 1) Maria Jacobsen and Karen Marie Petersen fishing at Lake Gölcük/Dzovk, ca. 1910. 2) Maria Jacobsen, kavas, and donkey at Lake Gölcük/Dzovk, ca. 1910. 1) Maria Jacobsen at the Annie Tracy Riggs Hospital, c. 1910. KMA postcard. Caption: Armenia. From the hospital in Mezreh. 2) KMA postcard, Transporting orphan children. A Daggry (Dawn) group, one of the 77 KMA youth groups, c. 1910, making handicraft items, which were sold to finance Emaus and other projects. This group held its meetings at Kong Christian IX's Dronning Louises Jubilæumsasyl, a kindergarten in Copenhagen. "Araxi, bottom right. Arminag [Armenag], top right. Kayana [Kayane], top center. The daughter of the oldest daughter, who lives in Harput, top left. The father, who holds the picture of the son in America, bottom, second from the right. The mother, bottom, second from the left. The oldest daughter, who also perished, bottom left." We can thus deduce that at least one family member, the oldest daughter "who also perished," had died after the photo was taken, and we also know that it most likely happened during the genocide. We know this because on the back the photo is dated "1913," but the caption was revised in 1916 - the number 6 is written on top of the number 3, indicating that the genocide-related info that follows was indeed added in 1916. The caption(s) must have been added by either Maria Jacobsen or Karen Marie Petersen, as both of them knew this devoted family personally and took a special interest in them. The Armenian letters on the wall behind the family is from Joshua 24:15, "As for me and my household, we will serve the Lord." One of the first of the young Emaus women to get married. These photographs (except a few) were put at our disposal by Matthias Bjørnlund. They are from the Danish National Archives. We are grateful to Matthias for his collaboration. 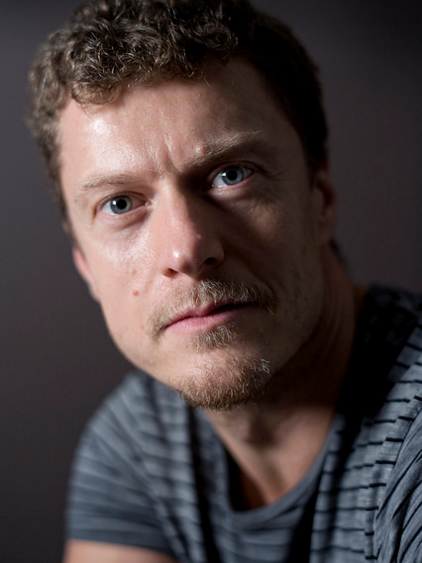 Matthias Bjørnlund is a Danish archival historian specializing in the Armenian genocide and related issues. 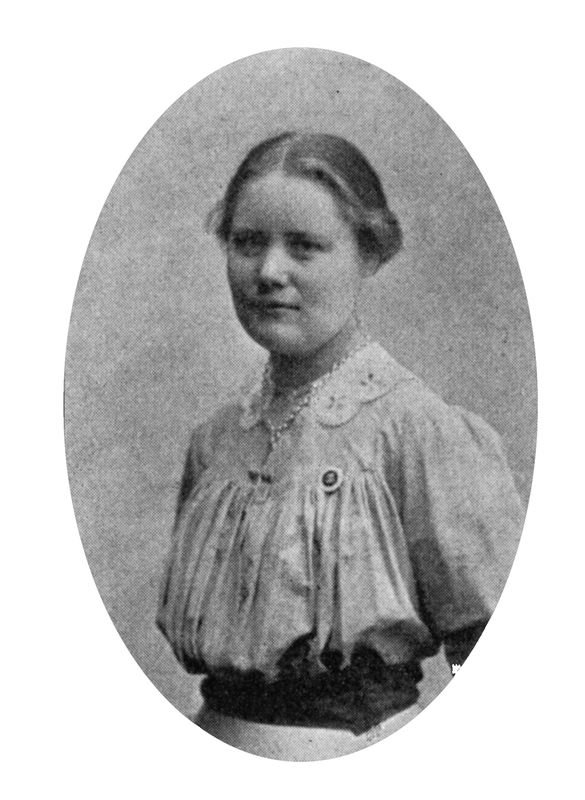 A young Jensine Ørtz/Jensine Oerts Peters.